Reserve Champion as a SHORN Yearling! 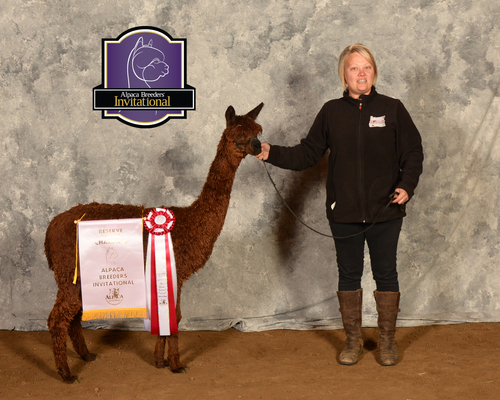 Chakotah is available for outside breedings at Rogue Suri Alpacas for a limited time! Chakotah in 2011 had a son win four Judges Choice awards, (Pucara) Chakotah's Wyuna, and a daughter, Buzz n Hum Layla who won GWAS 2011 Judges Choice. Chakotah ALSO won the Nationals and GWAS Get classes with Pucara Kahuna, his grandfather, in second both times. 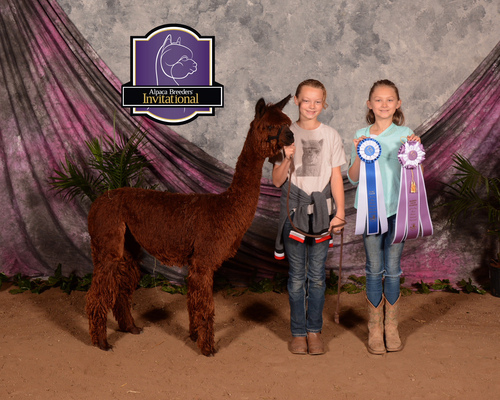 His cria won championships and ribbons in many shows all over the country. Chakotah's performance in the show ring has been exemplary. He exhibits extreme greasy luster, super silky handle, density in thick well defined locks from one end of his sturdy frame to the other and fineness. All with a proud masculine head on a well balanced body. As a mature male his frame is magnificent. Everything a stud male suri should be approaching 10 years of age - head style, frame, chest capacity, and above all great libido and fertility. Was this to be expected from the initial breeding. 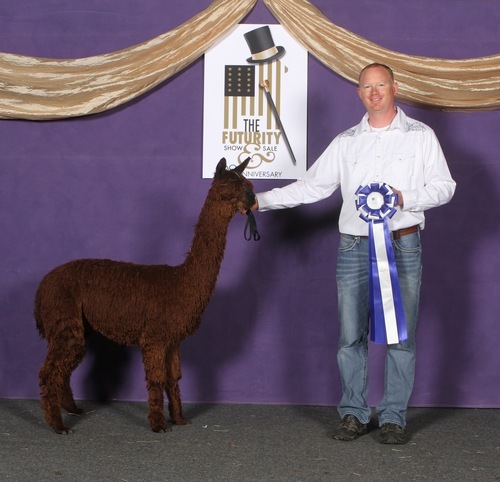 We hoped so because it was the marriage of genetics from Peruvian Bruxo, Peruvian Uribe, Peruvian Augustina (McGyver's mom), Pperuvian Amador and Peruvian Cadete (Accoyo foundation herdsires of our female herd), Pucara Kahuna and Pucara Allegro who had 37 championship winning cria in Australia of which 17 won Best in Show! The odds were stacked in our favor and are now stacked in yours because there is little room for deviation of outcome with this punch of prepotence. If you have a good female you'll get a great cria with this breeding. Chakotah kids have been wowing them all over the country. They have won championships and Judges Choice Awards in strong company !!! We think he is turning out to be every bit as good if not better than his grandfather Kahuna! Yes, she is hot like Sriracha!! This girl has it going on! Her mother, Tintiy, who carries one of the best fiber biopsies in our herd, has passed this amazing density onto Sriracha. 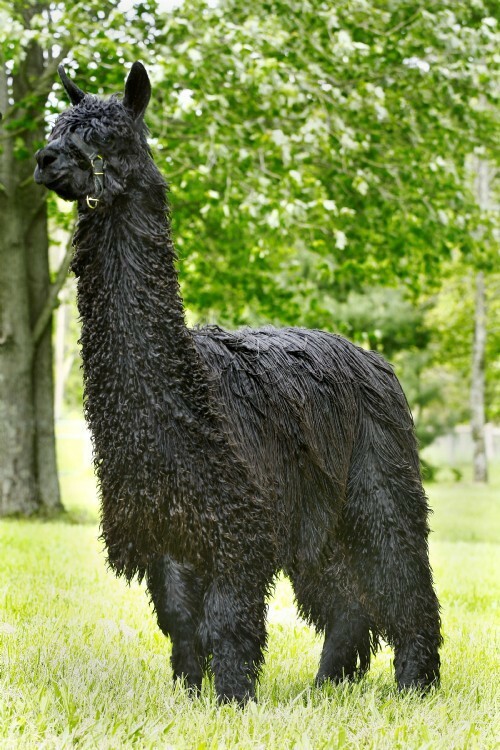 Sriracha's sire is the amazing 19X Champion Sierra Bonita's Peruvian Sniper. 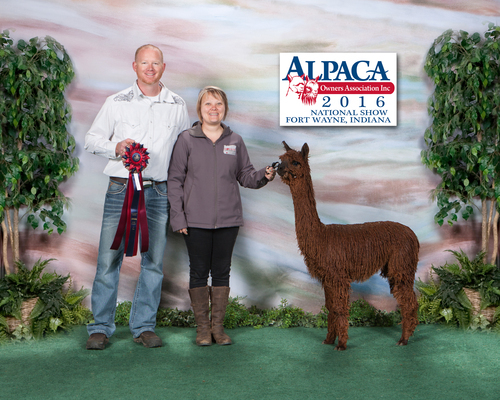 Sriracha did not disappoint in the show ring and is now ready to settle down and start her production career. We have chosen Multiple Herdsire of the Year, Chakotah of CCR Suris as her first date! 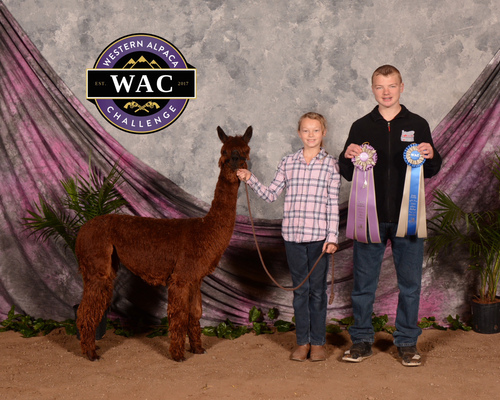 This will be a showstopping cria! “Rogue Suri Alpacas RGSA Sriracha” was biopsied as a 22 month old dark brown suri female with ARI#35267102. Her 15X scan shows fiber clusters that appear very uniform in size, shape and placement within her connective tissue. Her density is 73.25 follicles SQ MM of skin and her S/P average from 25 typical fiber clusters is 12.8 to 1. Note on her scans that 60% of her secondary fibers show medullation. She grades level 4 of 4 gland presence. 100 secondary fibers average 18.6 microns while 50 primary fibers average 28.1 microns for an average variation of 9.5 microns. Sriracha’s AFD on June 24, 2017 figures 19.34 microns.